Manufactured from TREATED HEAVY DUTY COTTON DUCK, NYLON, RAYON, KEVLAR FABRIC and reinforced with BUNA N, NEOPRENE, HNBR, VITON POLYMERS for demanding reciprocating & High Pressure Temperature Applications especially for Expansion Joints. 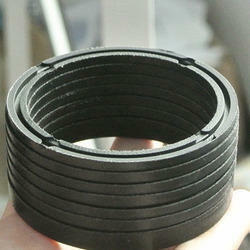 Supporting Spacer Seals are also supplied from PPS, PTFE, NYLON as per customer requirements. These components find extensive use in control valves. 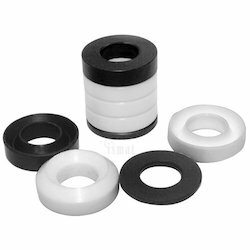 The “VUO and profile seals and packings are made as per customer specifications and drawings with best quality and appropriate grade of PTFE. We provide chevron packing and seals, designed specifically for sealing of rods, pistons and plungers in hydraulic cylinders and hydraulic presses. Owing to their excellent sealing capabilities, these find wide application in high pressure pumps. Chevron Packings And Seals manufactured by us are trusted for their distinct features of durability and air tightening. We provide Chevron Packing and Seals, designed specifically for sealing of rods, pistons and plungers in hydraulic cylinders and hydraulic presses. Owing to their excellent sealing capabilities, these find wide application in high pressure pumps. Chevron Packing For Plastic Injection Moulding Machine/Power Pack/HYD. CYL.